The Art of the Chinese Album, the outrageously beautiful exhibition at the Metropolitan Museum of Art, chronicles nearly 800 years of variations on a hybrid theme: painting and the book, fused into cinematically sequenced images, a meditative synthesis that speaks to our cultural disarray with startling immediacy. The album, as the exhibition demonstrates, is an exceedingly flexible form. It may have come into being as early as the Song dynasty (960-1279) to assist the study of calligraphy, as a way to compile and disseminate rubbings from calligraphic models carved into stone stelae. In fact, some of the more spectacular examples on display are Qing dynasty rubbings from the latter half of the 18th century. Bound into book form and accentuated with ink, the pages feature columns of white calligraphic strokes emblazoned on a black field with stunning precision and freshness. In addition to the conventional codex we use today, albums could be accordion-fold or vertically oriented; some are entirely pictorial while others pair images and calligraphy. The exhibition’s nearly exclusive focus on this particular format (augmented by a number of related hanging scrolls and handscrolls) helps to throw into high relief the variety and richness within the stylistic consistencies of Chinese art. Western references brought to mind (appropriately or not) include the Viennese Expressionism of Gustav Klimt and Egon Schiele, the Impressionism of Claude Monet, and Bauhaus graphic design. 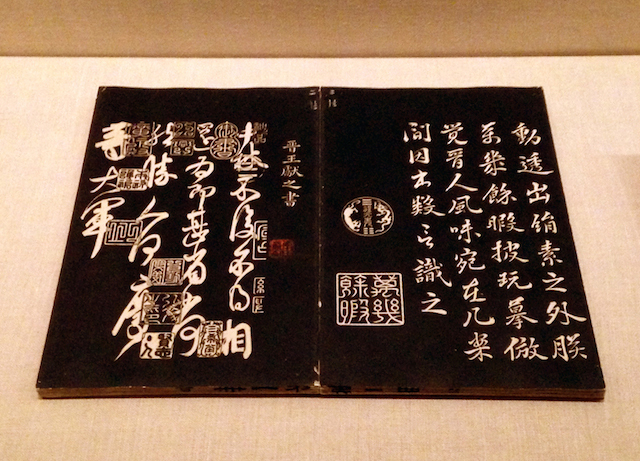 The Art of the Chinese Album was one of the three exhibitions included in a season preview I wrote at the beginning of the month, highlighting museum shows that promised an intimate viewing experience in contrast to the scaled-up art found almost everywhere else. 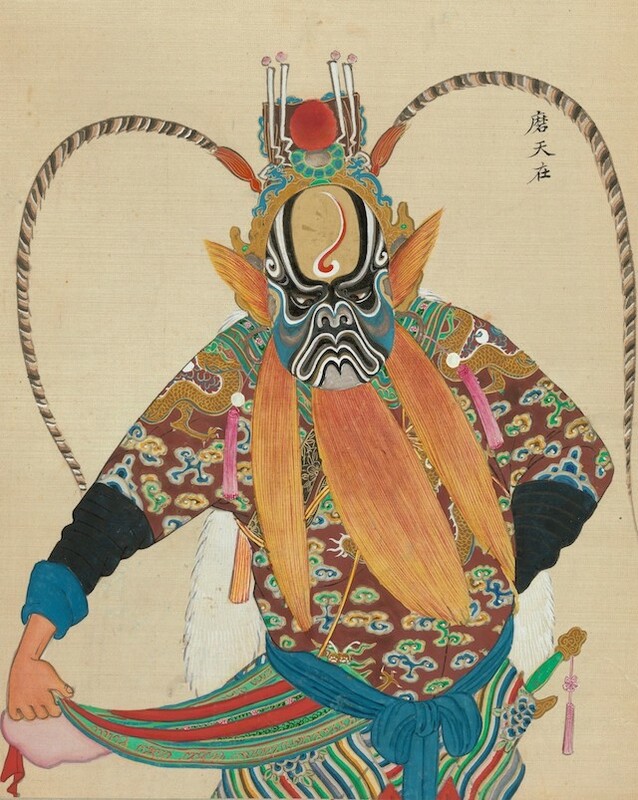 Among the artists mentioned was Dong Qichang (1555–1636), whose albums featured homages to various master painters, with each sheet painted in a different style. At the time, this sounded like an academic pursuit (which, actually, it was — Dong, according to a wall label, was a partisan of the “southern” style of painting and created these albums to promulgate its legacy), but one of little visual interest. His works, however, and those of Wang Jian (1609-1677 or 1688), Gong Xian (1619-1689) and Wang Hui (1632-1717), among others, are some of the most fascinating in the show. Lan Ying, leaf from “Landscapes after Song and Yuan masters” (1642), album of twelve leaves; ink and color on paper. The album “Landscapes after old masters” (datable to 1638 or 1650) by Yun Xiang (1586-1655), to take one example, ranges from streamlined, almost Deco-looking mountain ridges, to flatly etched rocky cliffs, to daubed stylizations of cloud-collared peaks and red-leafed trees that look for all the world like mid-1950s chinoiserie magazine illustration. 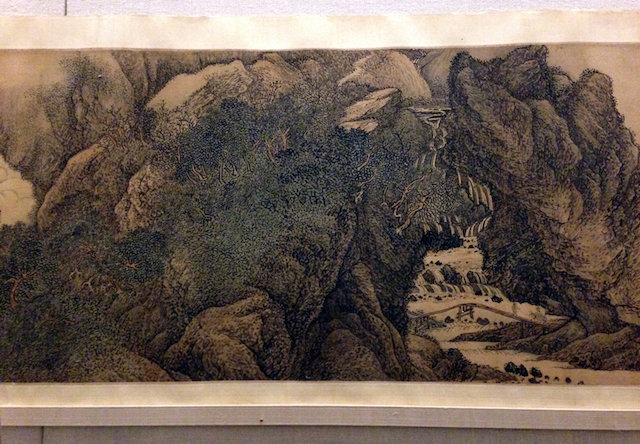 The differences among the approaches represented in “Landscapes after Song and Yuan masters” (1642) by Lan Ying (1585-1664) are even more extreme, with strongly outlined, gray-washed stony crags speckled with sharply contrasting black brushstrokes, alongside a blotted, minimally rendered landscape of mountains and lowlands disappearing into the fog. 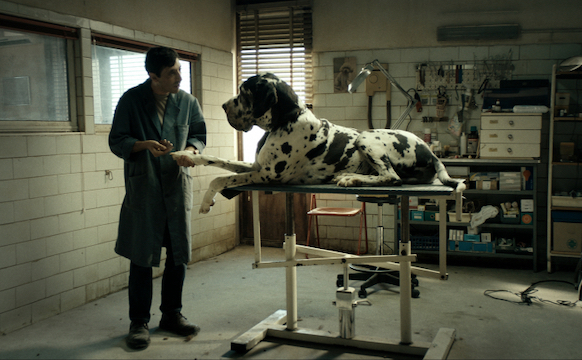 The disarming mutability of this genre evokes a raft of anachronistic associations, from the Early Modernist stylistic transformations embodied in the work of Pablo Picasso and Henri Matisse to the Postmodernist strategies of Mike Bidlo, Deborah Kass and Sturtevant, with both factions bound up in Romantic myth-making, promoting or denying the idea of the individual genius. Of course the 16th- and 17th-century Chinese artists making these homage albums are light years away from the accelerated dialectics of Post-Enlightenment Western art, with an ethos apparently more congruent with that of Russian icon painters or Medieval and Gothic artists, many of whom remained anonymous, repudiating their individuality in the service of God. But according to the exhibition’s wall texts, while these albums were initially intended to enshrine a canon of historical styles (Dong’s followers were called the “Orthodox School”), “painters from other schools [took] the concept of the old-masters album in different directions.” Even as they followed historical precedents, these artists melded old and new in pursuit of personal visions. Wang Hui, “The Colors of Mount Taihang (detail)” (1669), ink and color on silk. The politicking and generational rifts of these painters are but a sidebar to the bold and variegated painterly engagements overflowing this exhibition: the emerald green hills adorned with blossoming cherry trees by Wang Hui, in which he emulates the colors of the 13th-century artist Zhao Mengfu (1254-1322); the crazed, European-influenced imagery of the monk-painter Shizhuang (d. 1792), whose “Eight views of Mount Tiantai” (1766) features an enormous demon’s head carved into the side of a cliff, with a natural stone archway bridging a chasm that ends in a fantastical waterfall; and the searingly beautiful, honey-kissed painting of orchids by Ma Lin (ca. 1180-after 1256) dating from the second quarter of the 13th century. Chen Hongshou, leaf from “Figures, flowers and landscapes” (undated), album of eleven leaves; ink and color on silk. The sensuously linear paintings on silk from the mostly undated album “Figures, flowers and landscapes” by Chen Hongshou (1599-1652) and Chen Zi (1634-1711) are outstanding even among the marvels littering this exhibition. In an image of a red-breasted bird perched on a branch, the knots in the tree bark turn sinuously alive, slithering up, down and around like malignant fungi. The delirious formal inventions of this work (which prompted the comparisons to Klimt and Schiele) and others from this album (including dynamically sculptural depictions of plum blossoms and a cricket devouring a red leaf) sit on that tantalizing edge between fantasy and reality, summoning up sensations of childhood curiosity and wonder. 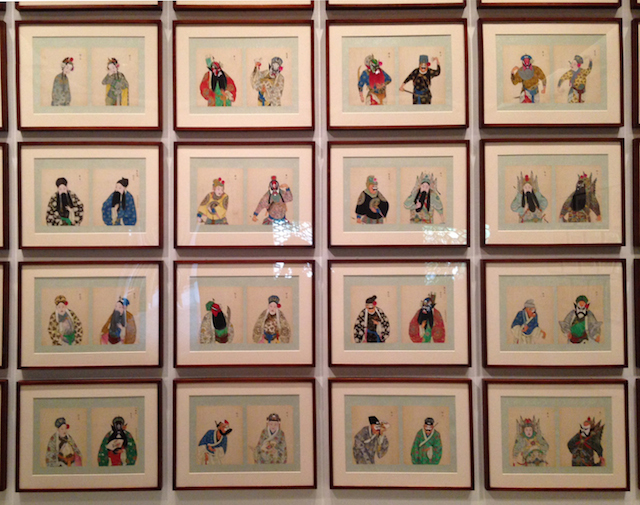 And then there’s the breathtaking “One hundred portraits of Peking Opera characters” (late 19th-early 20th century) by an unidentified artist. The portraits are from an album of fifty leaves (each featuring a pair of figures done in ink, color and gold on silk), with each sheet framed and installed on a single wall. Like Ukiyo-e actor portraits and Kabuki prints of 19th-century Japan, these works portray an actor in a role, but the opera characters are even more extravagantly costumed than their Kabuki counterparts, with some wearing elaborately articulated masks. The crisp color combinations that form these works are unfailingly striking and often audacious, with a flat, dense black as a major component, abutting deep primaries, dark earth tones and high-contrast whites with ringing clarity. The dazzling installation, so different from the intimate, softly lit displays elsewhere in the show, rewards both close looking and stepping away to take in all fifty pairs of figures, who seem to tick back and forth like a clock’s pendulum. “One hundred portraits,” mounted in the second-to-last gallery, feels like the climax of the show, but the final room, which is devoted to 17th-century Nanjing artists and features the remarkably varied and tumultuous landscapes of Wei Zhike (active ca. 1600-after 1636) and Fan Qi (1616-after 1694), provides a gratifying coda to the show’s predominantly low-key viewing experience. Unidentified Artist, “One hundred portraits of Peking Opera characters” (Qing dynasty, 1644-1911, late 19th-early 20th century). Detail of installation view. Album of fifty leaves; ink, color and gold on silk. 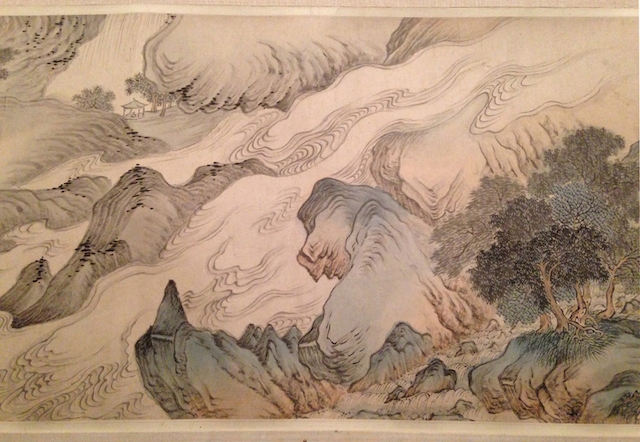 The jagged and near-violent pictorial rhythms in Wei’s handscroll, “Views of Nanjing in the four seasons” (1635), with its swollen rivers and enveloping fog, offset by moments of serenity — distant, silhouetted mountains interlaced by clouds, a flock of birds adorning the sky — encapsulate the bound energy coursing through the exhibition. The painting’s open, abstracted forms, with everything seemingly on the brink of dissolution, and the slow reveal intrinsic to the handscroll form, seem to simultaneously mark and stop time. 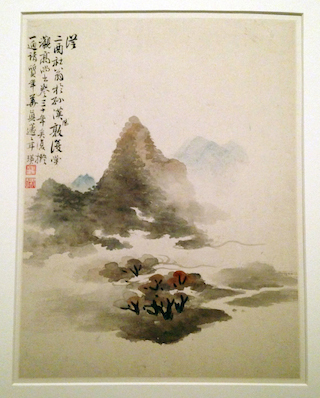 The unparalleled beauty of Wei’s “Views of Nanjing” notwithstanding, in the context of this show it is also a reminder of how foreign and, with its unavoidably partial views, frustrating the experience of a scroll can be; the album, with its rectilinear format, is much more accessible to a Western mindset: we can plumb the atmosphere and shadings, structure and color, of each leaf as a single, graspable configuration. But the album’s sequential imagery also undermines the primacy of the individual painting in an uncannily contemporary way. Each sheet is in a real sense incomplete without what comes before and after. This feels especially true of the leaves that include poetic inscriptions, such as those found in the album “Landscapes after old masters” (dated 1674 and 1677) by Wang Hui and his teacher Wang Shimin (1592-1680). The words do not create a narrative; rather, they become points along a path. Aside from some hanging scrolls, the art in this exhibition is entirely contextual and interdependent: the authority of the individual image is subsumed into a sequential, fragmented mode of transmission. Despite the remoteness of pre-1900 Chinese culture, with its scrims of tradition and centuries-long dynasties, the art in this show works as a correlative to the Post-Structuralist anxiety that greets a definitive statement of any form. Nothing, it’s understood, stands on its own. 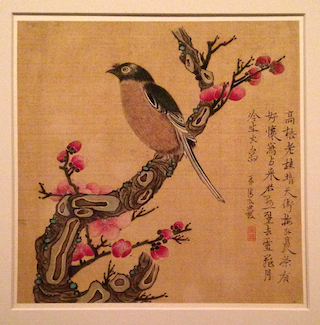 The Art of the Chinese Album continues at the Metropolitan Museum of Art (1000 Fifth Avenue, Upper East Side, Manhattan) through March 29, 2015.